Join the excitement and help make wishes come true! Now is your chance to be part of a halftime show with the San Diego Charger Girls and give back to the wonderful community of San Diego. 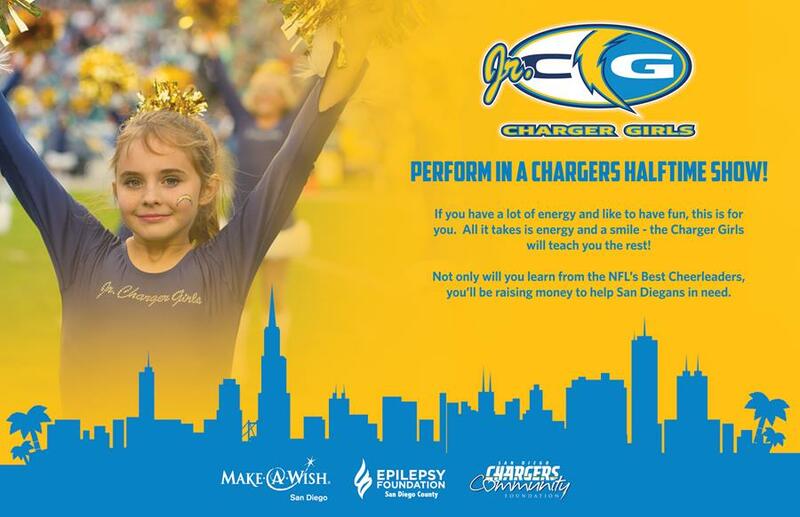 Participants aged 7-15 have the opportunity to perform in front of 65,000+ fans at the Chargers home game on December 4th against the Buccaneers. Each performer must raise a minimum of $175 in sponsor pledges. The money raised will help support Make-A-Wish® San Diego, the Epilepsy Foundation of San Diego County and the Chargers Community Foundation. The pledge minimum is required by November 19th to participate in the halftime show. For additional information visit chargers.com or call (858) 874-4500. You received this message because you are registered to receive Chargers.com e-mail messages.